We are a nation of animal lovers and it’s not uncommon for our little pooches to receive a visit from Santa at Christmas too. Nothing overboard, just a gift to get them involved in the festivities and to keep them happy on Christmas day when the kids are more interested in their new playstation. So I’ve been looking out for some pet presents lately, and seen some great gift ideas for our four legged friends. The pet professionals at Pet Planet have this ‘good boy stocking’ for pet dogs. It’s like a selection box of treats and a chewy bone to help maintain strong and healthy teeth. Filled with a delicious pack of turkey and cranberry flavoured bones, chocolate drops and a munch tree they’ll be overdosing on happiness and wagging tails. To top it off a rubber squeaky bone is included to help burn off those extra calories. Not a bad purchase for years of happiness from your companion – only £3.49 including free delivery. This is a gift not to be woofed at – a very personable food bowl with your pets name printed on it. There’s a few different designs to choose from which are really fun, colourful and will look great at your pooches eating area. So throw out the faded plastic bowl and get your pet a brand spanking new china bowl. The bowl itself has been handmade using high-quality ceramic so it’s hardwearing and durable – enough to withstand the most excited of puppies and dogs. He or she will love the professional finishing on the large brown paw print at the front next to their name so they’ll instantly recognise their very own bowl. This perfect yet funky gift is currently on sale at only £11.99. For the ultimate in humorous pet gifts this is the cat’s whiskers. For £4.99 from amazon, your kitty cat can be the main attraction on Christmas day with this Caribbean Pirate cat costume. It’s made of easily washable polyester and non-woven fabric, soft and breathable so they won’t feel the costume too tight and you can give them extra snuggles. 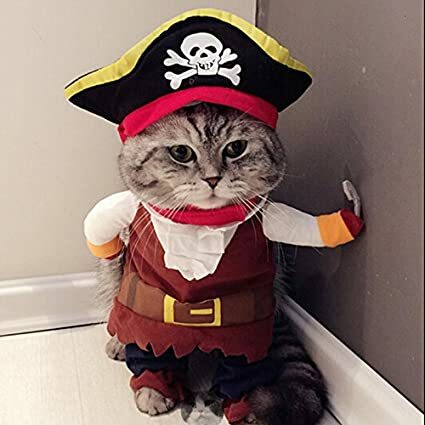 Your family will have lots of laughs as your pet pirate toddles around the house in the costumes authentic looking waistcoat, belt, pirates hand and extendable arms. If your cat likes to indulge in turkey dinner, don’t worry the sizing goes up to a large to allow for some belly bloat!